“The wooden blocks are 4 inches long, 2 inches square, some thinner: 1 by 2. There are about two dozen of them, one printed with an American Flag, to form a sort of stacking puzzle so that when you put the blocks together just right, stands the flag upright. 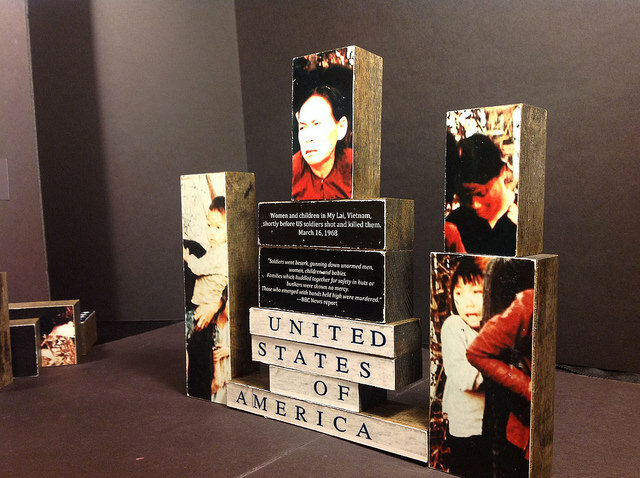 On a second set of blocks is a photograph of women and children in Vietnam, moments before being killed in the My Lai massacre. This is a collaborative art experience: participants sit at a table with the blocks in front of them to assemble the sculptural collage. They put together the flag and the photo of the women and children in their own arrangement. They build and then they talk about what came up for them, what the flag means, what the massacre means. Putting this sculptural collage together, they talk about how they put their country together in its contradictions today. The artist who made it is one of our own members: Mac MacDevitt, who brings it to schools and events and begins conversations as part of his work with Veterans for Peace. This is social justice work. Just as much as marching in the street or writing a letter to your senator. This is social justice work. It is an artistic experience that leads to heart-change.